November 30, 2008 by rwb, under Microcontroller. Hi,… where did you; I’ve not seen you in the class since this morning. 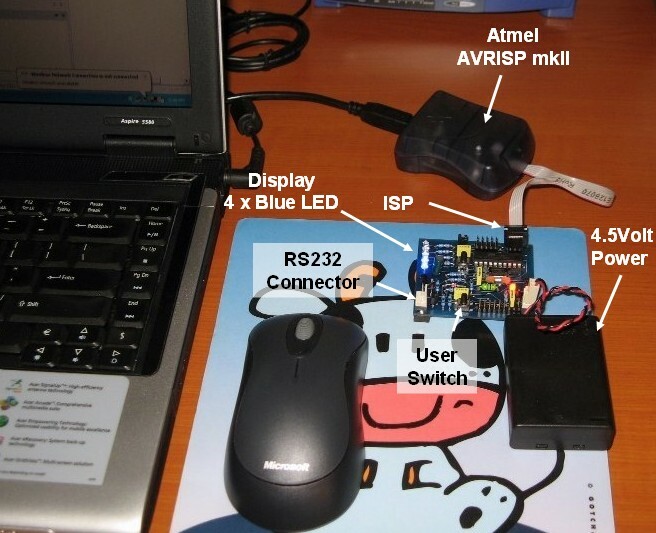 Yeah, I’ve bought this AVRJazz Tiny2313 development board and the AVRIS mkII programmers from ermicro shop. I think this board is suitable for starting my journey on the AVR microcontroller families. Hey, this development board looks cool; it has the 4 blue LEDs, user switch and the RS232 level shifting output, so we could connect it directly to the PC COM port. Are you free this afternoon; I’m really excited to test this new board and continuing our learning on the AVR microcontroller assembler language. Yeah let’s find a nice place to continue learning this AVR assembler language. I think I can talk to Timothy my good buddy; he is a micro lab’s assistance to let us use one of the lab’s class rooms. Susan this is Timothy; Timothy this is Susan my friend and my AVR coach as well. Susan nice to meet you; I’ve heard a lot of you from David; I’ve told David many times ago to start learned this assembler language; but now it’s look like he finally found a smart and pretty personal tutor. (In order to cover the blushed on her face; she just left them and rushed toward the empty class room; while they still smiled on her)…Ok shall we back to our business now? You’ve heard her David! Let’s start it (…and they both followed Susan into the class room). Ok, So far I’ve learned to use the AVR Visual Studio 4 for building and debugging the AVR assembler language now it’s time to put the code inside this AVRJazz Tiny2313 board. Most of microcontroller today has the feature for in circuit system programming or ISP for short; this means we could program the microcontroller even though it has been mounted on the production board. This feature makes upgrading the program easier, for example if we want to fix the bugs or add some new features on the board. Now let’s find this ISP on this board, usually for standard Atmel AVR it’s come in the 6 pins (2×3) for newest board or 10 pins (2×5) for the old one. I’ve got this 2×3 pin that labeled ISP on the board. What is the board crystal frequency? The .equ F_CPU statement simply tells the AVR assembler to use this value as the AVR microcontroller default frequency clock. Now we have to rebuild the program by pressing F7 or from menu Build -> Build. Select the AVRISP mkII platform and USB for the port then click the Connect button. 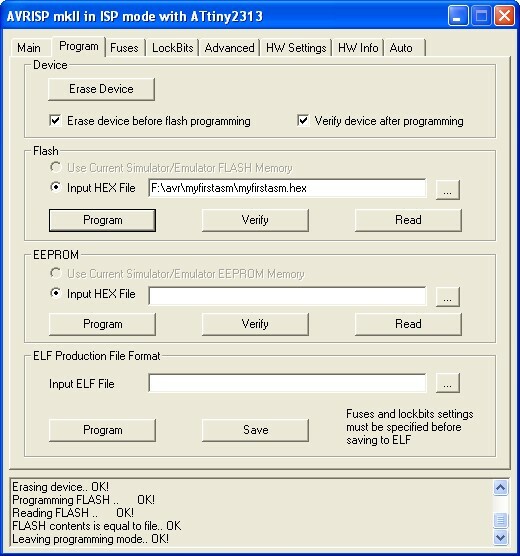 Select program tab and myfirstasm.hex file from f:\avr directory and then click the Program button; now the programmer will start download the HEX code into the Microcontroller. If everything is ok then it will give a message that programming the flash is Ok.
Wow now it’s run on the AVR microcontroller and It show exactly the same output as we run it on the simulator before. I think to make the program a little bit more interesting I will put some more code on it. What’s your opinion Timothy? Let’s put just a counter start from 0 to 15 and display it on the LED attached to the PORTB. Now the code looks more complex, but by writing the remarks as you did; it makes easier for me to understand the code. Basically Susan just leaves the first program unchanged and adding a couple of new codes for the counter program. From ATtiny2313 Instruction Set Summary datasheet starting on page 217; all of the new statements or mnemonics have their own meaning and you have to pay special attention on the Operation and the Flags columns. What actually this flag means; I see the Z, C, N, V and H characters. According to the Instruction Set Summary tables; this command will effecting the SREG register by changing the bits of Z, C, N, V and H. The brne command depend on the Z bit in SREG status register. If this bit is cleared which is “0”, means R18 is not equal to 16 then the brne command will instruct the microcontroller to jump to the loop label. Every ALU operation that resulting zero on the general purpose registers always set this Z bit in SREG register. That’s why this bit named Zero or Z for short. as long as the result of dec R21 command is greater than zero, the Z bit always clear (0) and the brne command will continue loop to delay2 label, but when it reach zero than the Z bit will be set (1); the brne command will check the Z bit and because this bit is set then it will continue to the next command which is dec R20. 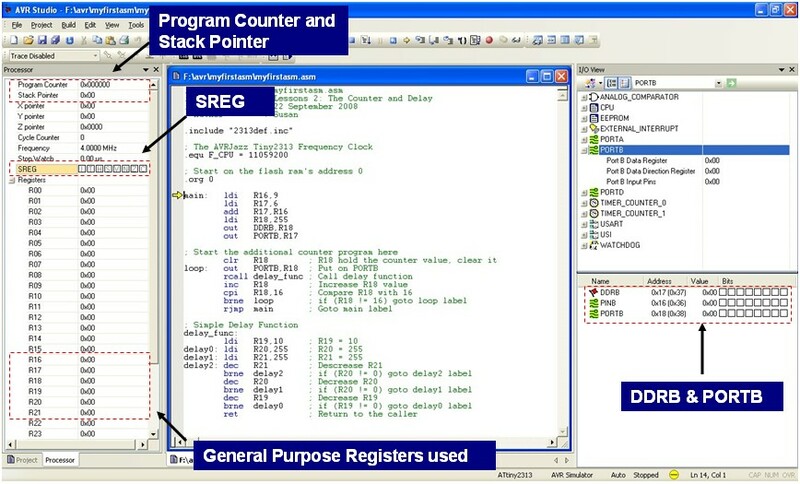 That exactly how it works, it will be more clear when you do the debugging process on these codes and pay special attention to the SREG register and the general purpose registers as you run through this code inside the AVR Studio 4. The other two command rcall (relative call) and ret (return) are dealing with the calling of program function and returning from it; same like calling and returning procedure/function on the higher level language. When rcall command is executed by microcontroller the return address of the next command after rcall which is inc R18 in our example will be stored onto the stack; and when the microcontroller execute the ret command it will load the return address from stack and start execute from there. What did you mean by the stack? Guys, I think today lesson is enough for me; I will debug or simulating this code and slowly try to have better understanding on this codes by my self; after that I will download the HEX code into the board. 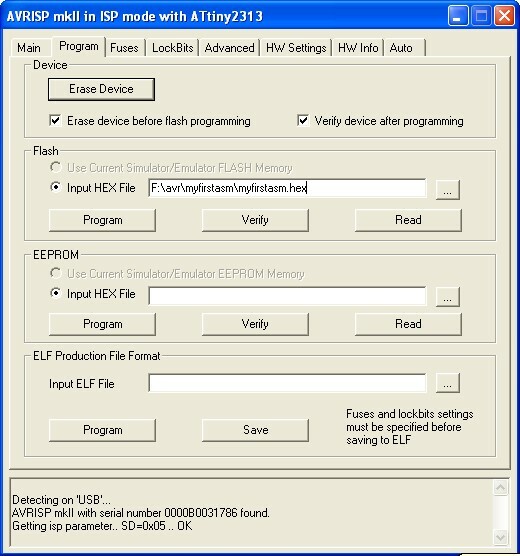 While you learn these codes; there is a good application note from Atmel titled AVR Instruction Set; try to search and download it from their site. This application note will explained in more detail every assembler instruction on the AVR microcontroller family. Thanks guys we will continue learning this AVR assembler language next time, but from now on; how about coffee time at the starbuck near here and this time on my treat! What are we waiting for, let’s go. Hello,I need to write a delay function in avr assembler with two or more registers. In my algorithm I need to have a formula with those registers and by changing those registers I must have any delay(sec) I want. I am new and I really don’t have an idea how to do that. Can anybody give me a hint?